The Christmas Hot Dog and Burger Stall is the tenth of a series of 3D house ornaments that make up the ThreadABead Christmas Village. This building compliments our previous market stall building to expand the Christmas Village market! Look who is visiting the Christmas Village! It's the Christmas Village Hot Dog and Burger Stall. Discover all the lovely tasty items they are selling, such as hot dogs, burgers and chips! As you look around the stall find an elf frying a burger on the grill whilst his colleauge is adding some mustard and ketchup to a hot dog and around another side see an elf purchasing food from the stall holder, whilst the elf on the final side is enjoying their burger and chips. The 3D house has been designed with a flat bottom it can sit on a mantle piece as part of a winter village scene. Made using Round Peyote and Odd Count Peyote the house takes around 8 hours to bead. As usual with ThreadABead featured patterns we give full detailed photographic instructions and in this pattern there are 46 detailed steps, making this pattern even suitable for beginners to beading. Please note the pattern may not work with any other size and type of beads. There are 16 colours in total and the finished beadwork is approximately 3.5cm (w) x 3.25(d) x 3.25 (h) cm Wadding is optional and a no tangle thread bobbin is useful. If the beadwork is to be used as an ornament some ribbon/thread will be needed to hang the beadwork from. 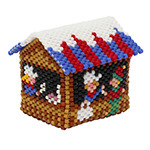 The bead pattern supplied is 15 pages and includes full colour photo instructions and a coloured pattern chart where needed.